The clove is an evergreen tree, 15-30 feet tall; it has opposite, ovate leaves more than 5 inches long; and its flowers, when allowed to develop, are red and white, bell-shaped, and grow in terminal clusters. The familiar clove used in the kitchen is the dried flower bud. The fruit is a one-or two-seeded berry. Native to the Spice Islands and the Philippines but also grown in Sumatra, Jamaica, the West Indies, Brazil, and other tropical areas. Clove oil is comprised of eugenol, caryophyllene, acetyl eugenol, tannin, wax and fat. 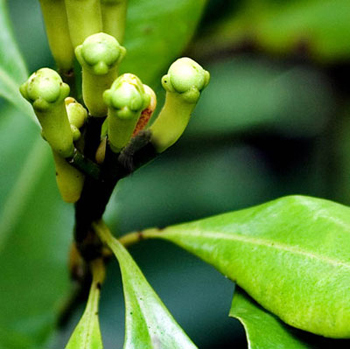 Cloves are actually the dried buds of the clove tree. Used in China for more than 2,000 years, legend has it that cloves are an aphrodisiac. Although there isn’t any evidence to back up this claim, we do know that oil of clove is a time-honored remedy for toothache. It aids digestion, allays flatulence, nausea and/or vomiting, stops hiccoughs, and treats impotence. Used for colds, cough, asthma, hiccough, laryngitis, pharyngitis, low blood pressure. Cloves are mildly aphrodisiac. The volatile oil is a powerful analgesic. Ground spice in breads, cookies, spice cakes, pies, fruit dishes, curries, and some meat dishes. Oil: for toothache, rub oil on affected area. For vomiting, mix 2 drops of oil in a cup of water. 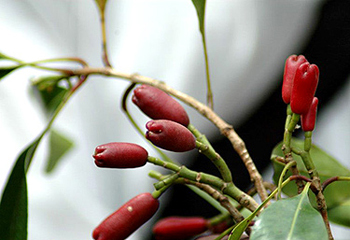 Avoid cloves in cases of hypertension and inflammatory conditions.